A quick animation of how to implant the HeRO Graft and cannulate the ePTFE graft. Your surgical team may have already told your dialysis staff about your new HeRO Graft. However, it is very important that YOU also remind your doctor and care team about your new access so they can take good care of you. The makers of HeRO Graft have created a wallet card for you to carry with you. Showing this card to your dialysis center care team will help them know that you have a HeRO Graft. 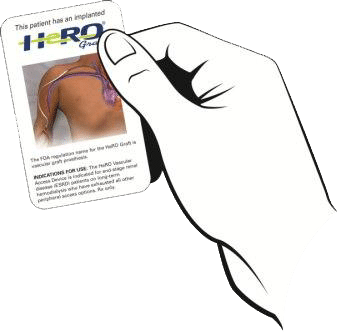 The wallet card is provided in the Patient Information Pouch of the HeRO Graft product.